Wedge Salad Platter for a Crowd! – This beautiful and unique salad will be a hit at your next party! It takes only minutes to make with easy store bought ingredients! Wedge Salads are back! They disappeared for a few years but like everything old…it becomes new again! Somebody tell my body that pa-leeese! I first saw this platter at a party in Palm Springs. And let me tell ya, Palm Springs knows how to party! I am lucky my BFF lives there. She has a beautiful home and wonderful fun friends! We were invited to her neighbors house, Karen, for dinner. And this beautiful salad was prepared by another friend, Anita. What a cool idea for a party salad! And super easy to throw together! 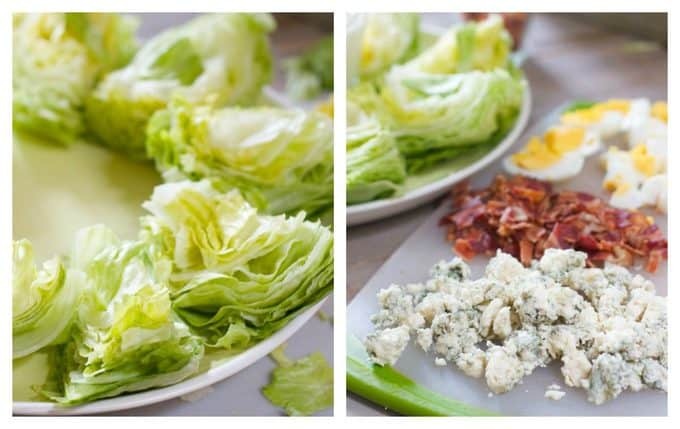 How I made this Wedge Salad Platter! When choosing your lettuce, go for lightweight heads. The lighter the weight, the less dense yellow lettuce you will have in the center. I used two small heads of iceberg in the photo. Simply quartered it. Your toppings are chopped bacon, eggs and crumbled blue cheese. I cut everything in large chunks. I used a store bought blue cheese dressing, because, well, ya know…lazy cook :). And with so many great brands out there, why not! Go for one in the cooler section of the produce department for super fresh flavors. I used Lighthouse brand. I dressed it all up before I served, then put some additional dressing in the center. Pretty easy! And the good news is it stands up better than a tossed salad. The iceberg stays crisp for hours…even in the Palm Springs heat! This recipe is for 8 but you can adjust it to suit whatever number you need. You can see all my salad recipes HERE. But here are a couple of my faves! Spinach and Avocado Salad with Blueberries. A power house of nutrients and fresh flavors! Or Fresh Corn Salad with Avocado – no cooking required! Serve the corn fresh off the cob for a fabulous crunchy salad! To Fresh and Easy Entertaining! 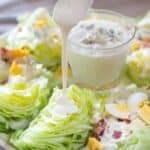 A super easy to make salad with fresh bleu cheese, bacon and egg crumbles! Slice both heads of lettuce into 4 equal size portions for a total of 8 wedges and place on tray. Sprinkle with blue cheese dressing, bacon, eggs and cheese crumbles. Add an additional bowl of dressing in the center. 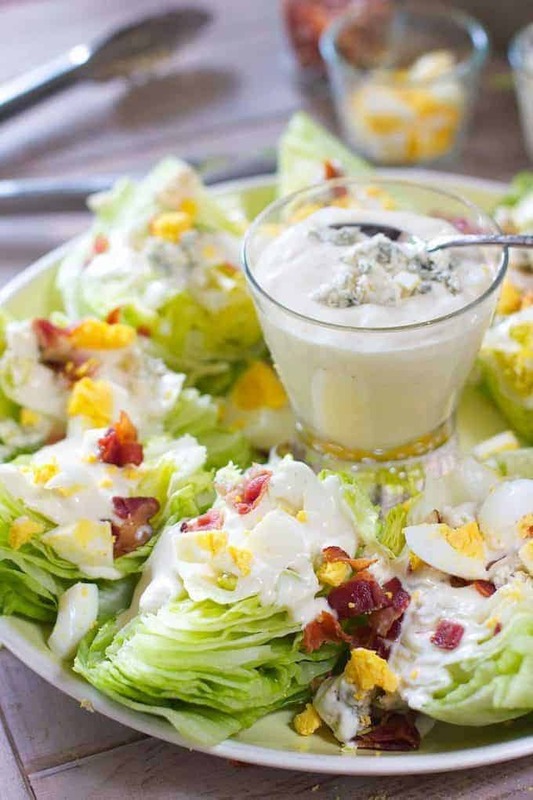 What a great way to serve wedge salads to a crowd! Lots fo rave reviews from my guests. Thanks for a great recipe! Hi Holly! I am so glad you and your guests liked it! It’s so easy too! Wedge salads are totally back and this one looks delicious. I’ve never seen wedge salad here, sounds good. Must try one day. 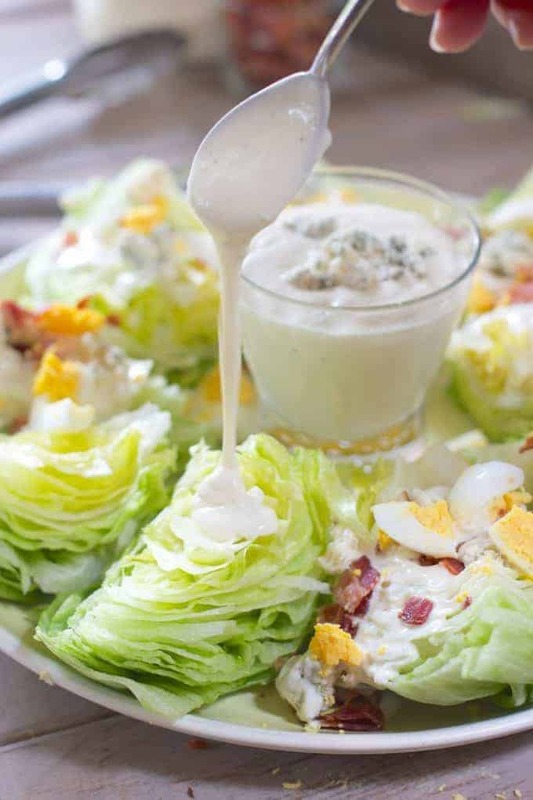 I’ve always wanted to make a wedge salad at home, and for some reason, assumed it was a lot more complex than this! huh! I can totally do this! Hi Tina! I forgot how they simple they were too! Super easy and fun recipe for a party! Mmmm. I love wedge salad! I love how you put the dressing in the middle! It makes for a delicious and easy to serve salad ! Great recipe. Can never have enough dressing :). Thank you for the note Elaine! I haven’t had a wedge salad in forever, but I know they’re in fashion again. This would be great with a nice grilled steak for dinner! Having it for Dads day with BBQ ribs and it’s so easy to serve! Thanks for the nice note Lisa…love your blog! How do you eat these? Are they finger food? Or a side?? Hi Lori – I consider them a side. Eat with a knife and fork. Traditionally a steak knife is served with them. Had never thought of doing salad this way. My family is picky. Dressing would have to be ranch in our family, and a variety of veggies could be included to please everyone’s tastes. I love the idea of Ranch! It goes really well with crisp Iceberg…why not! That’s so funny! The last time I had a wedge salad was 10 years ago in . . . .you guessed it! Palm Springs! I had forgotten just how good they are! Thanks for the inspiration. Thanks for the note Elaine! Just hold onto those old cookbooks right? Something will come back around!